A few weeks back I visited the Scottish Fisheries Museum at Anstruther in Fife. 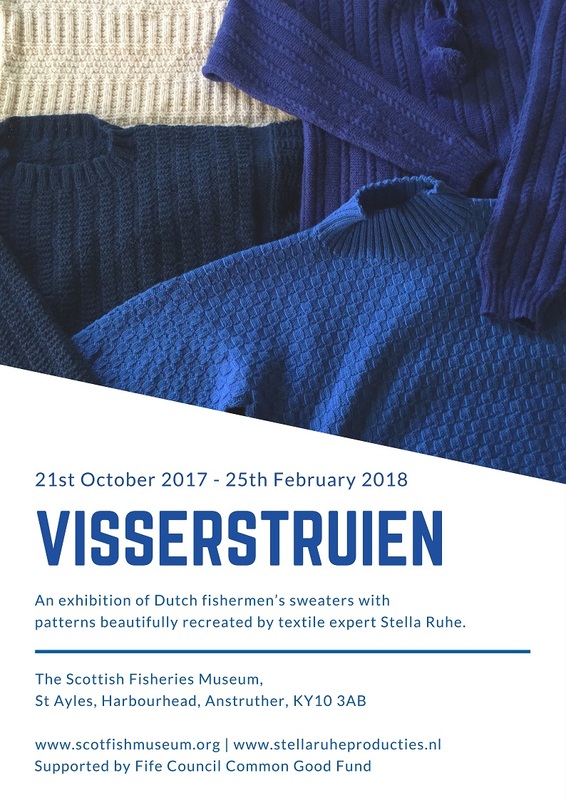 I was keen to visit the travelling exhibition 'Visserstruien - an exhibition of Dutch fishermen's sweaters with patterns beautifully recreated by textile expert Stella Ruhe'. This exhibition will remain in Anstruther until February 25th. As I entered the room , hung with around 20 or so exhibits, what struck me first was the colour. Most Dutch ganseys, as we call them, were knitted in deep blue, cornflower blue or a petrol blue, somewhat different to the natural cream or navy tones we are used to in Scottish and English fishing communities. Then I had a moment's disappointment when I realised these were recreated - recently knitted - garments. This has been clearly noted on publicity for the exhibition, but I had somehow assumed these would be original exhibits. But, as Stella Ruhe explains in her book, 'More Traditional Dutch Ganseys', which is on sale in the museum bookshop, few of these original garments remain. Not only is there the problem of the perishable nature of the wool itself, but more significantly, these were work garments, knitted by women. They were held in regard for their practical qualities, not for any aesthetic significance. They were usually worn to destruction, then often used as mopheads to clean the decks. Stella has recreatd the exhibits on display from painstaking research - finding photos and cataloguing the patterns seen in them. I soon appreciated that these were new garments however, since I was able to gently touch them, feeling the fabric and noting the internal construction techniques. These are simple sweaters,often knit in the round from the bottom up, then divided under the arms to knit the front and back flat , before joining at the shoulders and picking up stitches to knit arms and neck. The beauty and interest is in the elaborate designs and motifs knit into the fabric, including , amongst others, the tree of life, the ropes, the eye of god and diamonds so common also in British ganseys. Indeed the exhibiton provides further evidence that the notion each fishing village had its own designs is in fact a myth. It is clear that British knitting patterns influenced Dutch knitters and vice versa. (Dutch vessels would dock in numbers in Shetland during the season.) Many of the women knitting these sweaters would have been 'herring girls' moving from port to port during the season. They were on the look out for new motifs and patterns all the time and took these back to their home towns to incorporate into later designs. Stella noted that only a few of the most remote and most religiously devout villages in Holland had their own distinct patterns. Similarly, there is no first person evidence to back the notion that drowned fishermen were idenified by their ganseys. Although it is probably fair to say, that, if found intact on the body, the knitter would recognise her own work. While the exxhibition was fascinating, the real delights for me were in The Scottish Fisheries Museum's own permanent collection of local knitwear. It was impressive and touching to see motifs, handdrawn on graph paper , by a Mrs Jessie Corstorphine of Cellardyke. This visit has given much design inspiration. Some of Lifelong Yarns blends, in particular Soutra and Bowden, would be very much suited to creating hard-wearing ganseys. I may have to put my pattern designers hat on - if I can find it ! I believe, towards the end of this exhibition's run, Stella Ruhe herself will deliver a lecture. Keep an eye out for the date.